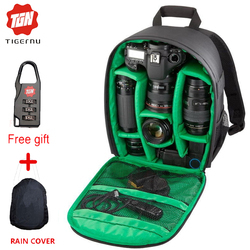 Home › Camera & Photo Accessories › Camera Video Bags › Tigernu Pattern DSLR ..
very fast shipping. so far so good with the quality of the bag. it's a little smaller than I thought but it's perfect to fit under an airplane seat. I will leave another review after my trip to see if this bag holds up with my dlsr and the lens and attachments. super quality nice figment, the Compliant perfectly using was finding. fast shipping (16 days SPAIN) and perfect. good communication seller. looks pretty Tough backpack material, good finished. super buy content. The main markets are Asia, the Middle East, Africa, South America etc. Our company integrates the design, manufacturing and marketing together, as a professional manufacturer of laptop bag, laptop backpack, laptop sleeve, digital camera bag, luggage and other high-end products. We thoroughly apply ISO9001:2008 international quality standard. We also inspect each working procedure strictly and scientifically, including the procurement of materials, production, packing and shipment to guarantee the best quality of all the commodities. We strictly implement QB/T1333-2010 national standard. Our company brings together a group of highly qualified professionals, through a full range of market research, fully knowing about the needs of users. In 2012, we launched our brand Tigernu to all over the world.